Cairo (HAN) May 7, 2014. The Oromo diaspora community Protesters gather in front of Arab League in CaIRO to call for international intervention in violent situation in Oromia state, Ethiopia. According to the Regional security Expert, in this case, Protest law in Egypt were not applied, but facilitated Oromo community protest in Cairo. “A penal code cannot be put into force retroactively,” lawyer Walid al-Leithy told reporter. The protest law sparked anger among political activists and parties, who considered it a means to restrict the freedom of expression. Many parties, including the April 6 Youth Movement, have held several protests against the law. 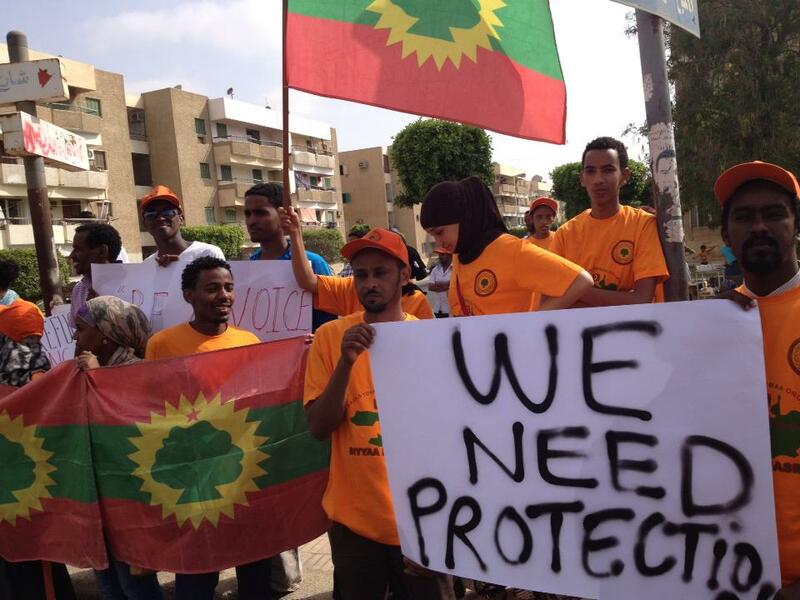 But, The Oromo community in Cairo organised a protest in front of the Arab League in Cairo’s Tahrir Square on Wednesday to denounce the killing of Oromo protesters in Ethiopia last week. Dozens of the Oromo protesters demanded the Arab League, African Union and the United Nations intervene in the situation in Ethiopia’s Oromo state, where tens of ethnic Oromos were killed last week in protests over the expansion of the capital Addis Ababa. Ethnic Oromo students have been protesting since April against the Ethiopian, who they accuse of intending to displace farmers from their territories in the capital of Addis Ababa through plans to develop and urbanize the city. In egypt If there is one advantage in the protest law, although there are not many, it is that anyone who organizes a peaceful protest without informing the authorities may pay the fine only,” he said. Geeska Afrika Online Archive 2013: Last Year, Refugees from Ethiopia’s Oromo community protest outside the office of the United Nations High Commissioner for Refugees (UNHCR) in Cairo, Egypt against the construction of the Great Renaissance Dam. Abdel-Kader Goumy, one of the protesters, told Al-Ahram’s Arabic language news website that the Renaissance Dam is intended to generate electricity, and, as such, there is no reason it should be built on the Nile, rather than on Ethiopia’s other rivers. Oromo refugees in Egypt: “The tribe supports Egypt’s right not to be adversely affected by the dam, Addis Ababa is not in need of water, rather it aims to build the dam for political purposes,” he added. Sources: SARA OSAMA SHOUREAP, edited and upted by Geeska Afrika Online security Reporter. First of all congatulation for your beautiful Megazin -Great -I like it. We africn are fighting poverty not only the IGAD -zone . Because poverty is the only enemy we have for the long time and enough is enough . as an african country and neighbour , Egypt has missed to help ethiopia as she was suffering under famine katastrof. Now it was nice when Egypt try to help ethiopia as she tries to overcome poverty once and forall. The great mistake Egypt could is to miss this chance. Imagin what ethiopian could do when she wants to harm Egypt. Egypt does not need to fear .Äthiopien will not hurt egypt in no case. Because äthiopian has never tried to harm their neighbors never. Egypt don’t care about Oromos…Few Oromos are just being used to settle score with Ethiopia. They accomplish nothing by attempting to put the Oromos at odds with The rest of Ethiopia. Everything Egypt does makes Ethiopians unite and be stronger. Ethiopia however, will overcome this and overcome it in spectacular move…it is expected from this GOE to deliver such blow to the enemies. these tigrays are now blaming egpyt for their own oppression of oromos and amharas? these tigrays will stoop to any level. Are these people suffering from a severe identity crisis? Do they despise their dark skin and have a deep seated desire to be Arab? Notice how they protested in front of the Arab League. They’re making this about Arab nationalism, trying to exacerbate the Egyptian regime’s so far impotent attempt at reviving Arab nationalism against their ancient foe, Ethiopia. The Oromo activists are just another example of blacks having so much hate for other blacks, they would side with their would-be masters, with people that see no value in them, except as pawns. There seems to be black folks like this in almost every country with sizable black population. 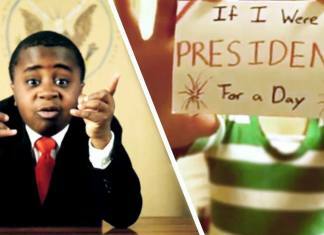 Only blacks who are ashamed or have a severe identity crisis would do something like this. Dude, chill. Oromos are descendants of Nubians. We are Cushitie people. We come from those who originated from the kingdom of Kush. The king of the Kushitie people then was Nubain. Nubians also ruled Egypt for thousands of years during ancient times. Specifically the 12 dynasty (which was was Oromo) to about the 15th dynasty. It might be longer. So really we are Egyptian. Research Oromos and our history with Egypt. That is our land just as much as it is these “Arabs” you speak of. 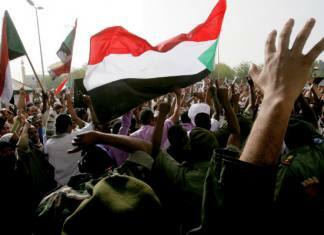 Whom by the way are northern Sudanese people. They’re not Arabs. I’m not bashing you, so don’t get upset or nothing. I just thought that I’d point out the fact that everyone in Egypt including those northern Sudanese people who look, speak, and act like Arabs, as well as the Oromos that reside there are all one people. If we’d somehow learn to look passed this sickness of tribalism, maybe we’d understand that, and maybe then these modern Egyptians wouldn’t hesitate to assist their own people, I refer to us of course. So chill with all this ” they would ‘ve been your masters ” bs. They’re our people. Period. The internet is there if you wish to debunk my claims. We as oromos are really detached from our history akhi. Something must be done to fix this detachment. Don’t you agree? Oromo people has no worst enemy than Tigre government. 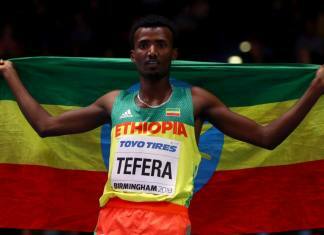 Anything is welcomed that makes Tigre shifta removed from Oromia. The so called dam does not help Ethiopian people but Tigre an elites who sale every thing to fill their pocket. 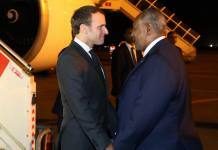 Right now they are selling power to Djibouti while even the capital city is in darkness. What hey are doing is looting and killing. If Egyptian are really serious about their future, they simply help us to remove Tigre from our land. We have enough rivers than Nile. There are so many rivers than Nile that Ethiopia can use for generating power. This GERD is the creation of Meles overnight to divert attention of the people from Arab Spring uprising. minute to move foreword by rallying the masses to achieve the broad based development. In the 21st century cooperation rather than intrigue maximizes benefit for all. OLF does not represent any single person in oromia. 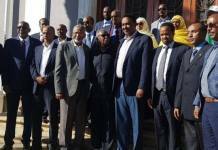 If only these so called “Oromos” some of whom foolishly look Egyptians know how they are conspiring against the Oromo people itself…who is to live alongside Oromos? Egyptians or the rest of Ethiopians…trading in the name of Oromos will not pay just like trading in the name of banda Eritreans has not paid…. The recent unrest in the so called Oromia region, as designated by TPLF/EPRDF, is well expected. The root cause of this and any future conflict is the language and ethnic based federal structure designed by TPLF/EPRDF. The only way out of this mess is correcting the federal system although it seems to me that it is very hard to do the change without angering some people. No way no any option for our Egyptian people than discussion for both peoples benefit. if now they try to destabilize with some Oromo ethic it is a joke. We recognize those arranged protest in Cairo they want it for USA political asylum consumption we wish them to travel USA after they reached USA we don’t think they will remember it they made protest in Cairo because they dream was to reach USA. We don’t see this kind of cheap politics can change the Ethiopian peoples determination brothers leave alone Egyptians to solve their eternal problem..
Egypt has the right to use Nile (which is Abbayaa in Afaan Oromo ) whose main tributaries are from Oromiyaa. We support our Egyptian brothers and sisters who depend on Nile to exist as a nation. The Oromo people have historical ties with the Nubains and Sudenesse –of whom all of are Kushites. ***** The Ethiopian government led by the Tigre minority ( Tigray People Liberation Front ) is using this dam to divert attentions from its repressive nature . Over the last two decades , they have been killing , torturing ,jailing innocent Oromo students , and displacing Oromo farmers from their ancestral land … So we appeal to the Egyptian people to stand with us in these difficult times. ……….Thanks for reporting it ! Long Live Oromiyaa ,,,,,, Long Live Egypt ! 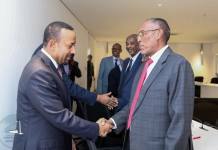 The Nile saga is a deliberate calculation designed by the TPLF government to gain political point to appease the public uproar against its dictatorial reign . Africans should know this deception. This is not the 1st time that the Tigre Minority militias have massacred Oromo students and unarmed civilians — they have been killing us since they clinched power in 1991 after the fall of the communist government. This called Addis Master Plan –which is in fact Master Clan killer is the continuation of their policy of annihilating the Oromo people. Peaceful protests by the Oromo people have always been blamed on either Eritrea or Egypt . As a background, Addis Ababa (Finfinnee in Oromo language ) is located in the Oromia region but it was unjustly made an independent federal region. However, the Ethiopian constitution guaranteed that the Oromia region will have a special privilege over the capital. The rationales for this were that: the capital is located in the heart of Oromia, Oromo resources are used in its development and Oromo communities around the capital are exposed to severe urban pollution. The special privilege remained on paper but in the meantime Oromos suffered from the expansions of Addis Ababa. For instance, most Oromia rivers passing through or near Addis Ababa have been poisoned to catastrophic extents so much that fishing in them has become a thing of the past. Livelihoods of farming communities downstream are completely destroyed. Additionally, Addis Ababa has been deliberately made to aggressively encroach into Oromia region for the last two decades. In the process, farmers were evicted forcefully in large numbers from their ancestral lands with compensations that amounted to less than one-thousands of the value at which the authorities sold land to property developers. The once thriving Oromo farming community were made destitute, thrown onto the streets and making a living by working on property development sites as laborers or, still worse, as beggars on the streets of Addis Ababa. The people of Oromia are peace-loving people. The case in point : General Taddesse Birru by training Nelson Mandela has contributed to the freedom of South Africa. All Africans including Egyptian people have moral responsibility to help the Oromo free from the Apartheid regime in Addis Ababa. Oromiyaa shall be free ! Here we go and speak on behalf of our students, elders, children and mothers. The terrorist Ethiopian government has to stop killing us. Truth shall prevail. I really have a simple question to Summii Diina. By any means you have no moral ethics to challenge Tigraians on line even in fighting struggle. First of all when do you felt or enjoyed as human being dignity of Oromo in Ethiopian history ? wasn’t Tigraian who gave you recognition from second citizen of Ethiopian to self determination? second, who gave you freedom of speech and rolling your regnal stat of Oromia? Yes of …. course….Tigraian’!!! Third, who crate your bright of future guaranty (constitution) to resist as your Oromo in Ethiopia? Don’t worry bee happy, were ever your the Tigraian movement is word wide even your in the foot of our enemy Tigraian coming to liberate you from back wordiness of your slave mentality as to feel original and Great Ethiopia. think about it!! Pc, this massage is personally to you it doesn’t include others. Sounds an arrogant and a cat copy of those who believes they gave everything to the people of Ethiopia in clouding the right to live. You are truly hastening to your demise. Do not undermined a big nation like Oromos. Your mighty guns and war plane won’t save you when the time comes. You are a typical fanatic TPLF supporter. Tigres gave nothing to the Oromo people. The little gains that were achieved in the last two decades were the result of the Oromo struggle. What the TPLF brought to the Oromo people is genocide, environmental degradation, destitution and humiliation. All the bs you scribbled are far from the truth. I do hope that not all people from Tigray support the barbaric actions of the TPLF. I also hope that our Oromo brothers in Raya will start kicking TPLF’s a**. Egyptians tried to invade Ethiopia many times in history. They know we can give them a good lesson we gave them many times in the past. And because they know this, they are trying to use internal enemies. But they have not solved their internal problems yet. So, the few oromo diaspora protestors mean nothing as compared to the millions of oromo people who are supporters of the dam. Because the oromo people know the difference between the meaning of the dam and the politics of the EPRDF. And GootaGalaan and Bakakoo are also wrong. But especially Micahele and GootaGalaan are extremely going a wrong direction. Stop it! We are all Ethiopians, black African. that is it!